We could be looking at ice-free Alps by 2100. And yes, it’s because of climate change. 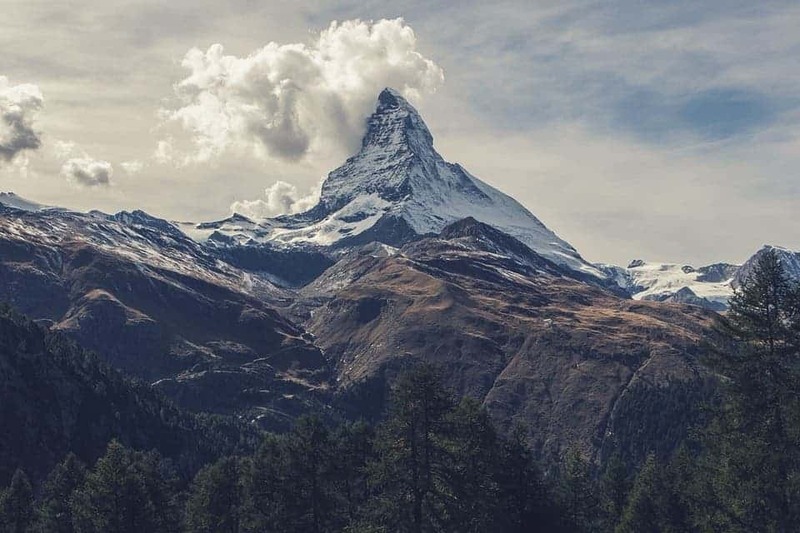 Matterhorn, the ‘Peak of the Meadows’, a mountain in the Alpine range straddling the border between Switzerland and Italy. New research found that the European Alps could lose all their glacier ice by the end of the century. Under a limited warming scenario, the mountain range would lose about two-thirds of their current ice volume. However, under a strong, unmitigated warming scenario, virtually all Alpine glaciers will be gone by 2100. “Glaciers in the European Alps and their recent evolution are some of the clearest indicators of the ongoing changes in climate,” says senior co-author Daniel Farinotti from ETH Zurich. The study provides the most up-to-date estimates of how Alpine glaciers (of which there are around 4000) will evolve in the coming decades, the team writes. According to the results, large changes in glacier ice volume in this area will occur in the next few decades. From 2017 to 2050, for example, the team expects roughly 50% of their volume to melt away — regardless of any slashing of emissions on our part (due to climate inertia). After 2050, however, “the future evolution of glaciers will strongly depend on how the climate will evolve,” says study-leader Harry Zekollari. “In case of a more limited warming, a far more substantial part of the glaciers could be saved,” Zekollari, a researcher at ETH Zurich and the Swiss Federal Institute for Forest, Snow and Landscape Research, now at Delft University of Technology in the Netherlands, adds. This melting will have a pronounced impact on local alpine ecosystems, of which the glaciers play an important part. Local landscape and economy are also likely to see perturbations, the team adds. The glaciers supply local ecosystems with fresh water, and keep local agriculture and hydroelectricity production going in warm or dry periods. They also attract a lot of tourists. Zekollari and his team used computer models that combined ice-flow and ice-melt processes with observational data to see how Alpine glaciers will fare in the future. They used 2017, when Alpine glaciers had a total volume of about 100 cubic kilometers, as the ‘present day’ reference. Under a limited warming scenario (RCP2.6), where greenhouse gas emissions would peak in the next few years and then decline sharply — leading to warming below 2°C compared to pre-industrial levels by 2100 — Alpine glaciers would lose around 37 cubic kilometers of ice by the end of the century. Under a high-emissions scenario (RCP8.5), where emissions would continue to rise rapidly over the next few decades, the glaciers would be virtually gone by 2100. “In this pessimistic case, the Alps will be mostly ice free by 2100, with only isolated ice patches remaining at high elevation, representing 5% or less of the present-day ice volume,” says Matthias Huss, a researcher at ETH Zurich and co-author of the study. It pays to keep in mind that our current emissions are just above the quantities considered for this scenario. All in all, no matter what we do, the Alps would lose around 50% of their glacier volume by 2050. This happens because all the greenhouse gases we’ve already emitted will linger in the atmosphere for a while — until they break down, mean temperature increase is largely independent of new emissions. However, what happens after 2050 is very much in our hands. Another reason for this decline in glacier volume by 2050, the team adds, is that the Alpine glaciers currently have ‘too much’ ice. Their volume, especially at lower elevations, still reflects the colder climate of the past, as glaciers are slow to respond to changing climate conditions. Even if we manage to stop the climate from warming any further, keeping it at the level of the past 10 years, glaciers would still lose about 40% of their present-day volume by 2050 because of this “glacier response time,” says Zekollari. The paper ” Modelling the future evolution of glaciers in the European Alps under the EURO-CORDEX RCM ensemble” has been published in the journal The Cryosphere.